Nissan Teana is a luxurious sedan introduced by the Japanese automobile giant in India. It is available in two trim levels with a petrol engine as standard. 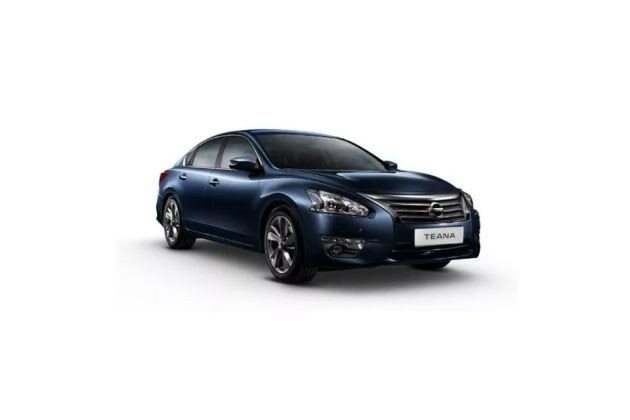 The Nissan Teana XL is the entry level variant and is available with a 2.5-litre petrol engine that is capable of producing a maximum power output of 179.5bhp in combination with a peak torque output of about 228Nm. This luxury sedan is blessed with numerous innovative aspects including a twin sunroof with power shade, Ottoman style power adjustable seats featuring leg rest that provides support for lower legs. The best part about this sedan is its exceptional cabin space that can provide luxurious seating for at least five passengers. At present, the manufacturer is offering this luxury sedan in a total of five exterior paint options like Onyx Black, Amethyst Grey, Brilliant Silver, Bordeaux Red and Brilliant Pearl White. This vehicle will be competing with the likes of Volkswagen Passat, Toyota Camry and others in this segment. On its front profile, it comes fitted with a triangular shaped headlight cluster that comes incorporated with high intensity halogen headlamps, courtesy lights and turn indicators. Its radiator grille is pretty large and it is done up with a lot of chrome treatment. The front bumper is bold with curvy structure and it is fitted with a pair of round shaped fog lights that are further accompanied by a chrome strip. In the center, there is a hexagonal shaped air dam that has a glossy black surround, which gives a distinct look to the front. The overall front profile is complimented by the chrome plated company's badge imprinted on the radiator grille. Its side profile looks pretty large yet stylish, thanks to its premium body fit and finish. Its B pillars gets a glossy black finish while the door handles and the window sills gets the chrome treatment. The door are further fitted with body colored external rear view mirrors, which are incorporated with turn indicators. The style and elegance of the sides are further enhanced by a set of 16 inch alloy wheels . Coming to the rear, it comes with a distinctly designed body structure, which gives a glimpse of coupe. It has a large boot lid that is embossed with the company's insignia along with a thick chrome appliqué. The body colored bumper has a plain design but it is equipped with chrome moldings and with a reflector lamp in the center. The main highlight of this luxury sedan is its spacious internal cabin with luxurious design that mesmerizes the passengers as soon as they enter. There is an extensive use of leather inside the cabin on the seats and its dashboard. Both the front and rear seats have integrated head rests and are covered with leather upholstery. Both the front and rear cabins have been accompanied with center armrest, while the rear seats also have lockable glove box compartment. Despite being the base level variant, the company is offering numerous utility based aspects like cup holders, intelligent key system, reading lights and several other important features. The leg space is very good due to a large wheelbase of 2775mm. This sedan also comes with a spacious boot compartment with a storage capacity of 488-litres, which is impressive. The car maker has equipped this luxury sedan with a sophisticated 2.5-litre, V-shaped petrol engine that is incorporated with electronic fuel injection system. It is based on a DOHC valve configuration with 6-cylinders and 24-valves, which can displace 2496cc . This V6 petrol mill can churn out a maxim power output of about 179.5bhp at 6000rpm, while generating a peak torque output of 228Nm at 4000rpm. The front wheels of this sedan will draw the torque output via an Xtronic CVT automatic transmission gearbox that also features a sports mode. This vehicle can breach the 100 Kmph speed mark in just a matter of 10 to 12 seconds and it can reach a top speed in the range of 190 to 195 Kmph. On the other hand, it can deliver a peak mileage of approximately 8.03 to 11 Kmpl, which needs to improve. The Japanese automaker is offering this sedan with a power assisted disc braking mechanism, which delivers exceptional performance. Its front wheels have been fitted with ventilated disc brakes and the rear wheels have been equipped with conventional disc brakes. This braking mechanism gets the further assistance from anti lock braking system, electronic brake force distribution and brake assist system . This sedan also comes with a power assisted rack and pinion based steering with speed related function, which offers excellent response depending upon the speed levels. On the other hand, its front axle comes with an independent strut suspension while the rear axle comes equipped with an independent multi-link type of suspension, which keeps the vehicle stable and well balanced. This Nissan Teana XL variant is equipped with features like electrically adjustable driver's seat, remote trunk opening, central console with 13-CD storage capacity, request switch door opening, all four power windows, door pockets, sunglass holder, lockable glove box compartment, rear reading lights, cup holders and several other utility aspects. This base trim also gets advanced features like push button engine start/stop function and a dual zone automatic air conditioning system with rear AC vents. Apart from this, the car maker is also offering an audio system with 6-speakers, CD-changer and AUX-in socket. This variant is blessed with numerous safety aspects that provide protection to all the occupants. The list includes a vehicle dynamic control system, foot parking brake, front active head restraints, 3-point height adjustable seat belts, front, side and curtain airbags, engine immobilizer system, speed sensing auto door locking and I-key (intelligent key) system. This model has improved zone body construction that is made out of ultra-high tensile steel, which maximizes the protection to the occupants. 1. Spacious internal cabin with luxurious seating. 2. Engine power and performance is good. 1. There is no USB and Bluetooth connectivity for audio system. 2. Low ground clearance adds to its disadvantage.